Sitting in the sound room, listening to Sting this morning. I have two cats, one on each side of me as I sit on the futon. Nuri on my left, Skeeter on my right. Phoebe, my dog at my feet. It’s like this nearly every morning with each of the pets. Anyways, after I do my morning pages, I am looking forward to experimenting with some of the visions I had last night about stamp designs I had. Cloth Paper and Scissors Magazine has a call for entry for mixed media stamp design. There is no theme, just a mixed media stamp design. 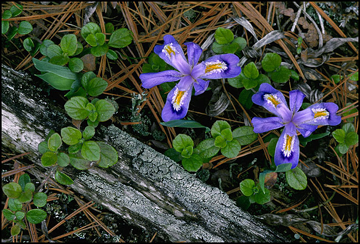 I thought I would do one representing Michigan using its native wild flower, which is Dwarf Lake Iris. Here is the link to the “reader challenge.” The winner gets a sheet of official postal stamps printed of their work. Stamps gives a lot of possibilities, but since I am into wild flowers and perennials, I thought I would pick one from Michigan to start with. Some of the visions I had suggested that I take various approaches with the image of Dwarf Lake Iris – more of abstract way. It is so pretty in its soft purple colors. I found a photo of it – where I love the various “textures” that can be found in it. The moss covered tree, the dried pine needles and fresh greens around it. There are so many possibilities I see with it! Since I am snowed in, I can’t run out to Joanns to get Linoleum block – I think I am going to start with a watercolor monoprint first. Then I may use watercolor pencils for certain details. I want to get linoleum block or experiment with styrofoam plate and do a brown or dark blue print over top of the monoprint. I also thought of doing a quilted fabric postcard concept as well – I’ve never done this but since I have been teaching myself sewing, I thought it might be another way to experiment with mixed media approach. I would love to do more in printing – I did find a place in Eastern Market that offers printing workshops. I would like to see if College for Creative Studies would allow me to use their printing room and take their printing classes. The Birmingham Bloomfield Art Center offers wonderful printing classes as well. Wouldn’t mind ending up with a certificate in printmaking as well, but there is NO PLACE IN MICHIGAN where I can get a certificate in printmaking! So, in the meantime, I am teaching myself monoprinting, and lino printing. Been saving my money towards a small etching press. I like monoprinting because it fits with my abstract style of painting and approach in arts. There is a place that I dream of spending time – but it will cost me an arm and leg to go there. It would be to go spend a couple of weeks, during the summer time at Anderson Arts Ranch, take their print making workshops, their painting workshops and their ceramics workshops. Then there is also Penland School of Craft in North Carolina, where you can spend a week doing various things such as photography, printmaking, and ceramics as well. It would be heaven! It is on my bucket list to attend both of them. The whites load is washed and in the dryer. The cats are still sitting between me. Snow is still falling. My mind is clear. I want to move on to other things on my “to do list” which is to play around downstairs in my studio. I also need to plan for the rest of the week sometime tonight.